A day after losing star outside linebacker Von Miller to a pending four-game suspension, the Denver Broncos said goodbye to another linebacker—Joe Mays. The team announced on Tuesday morning that Mays has been released, which will erase his $4 million base salaries in 2013 and 2014, creating approximately $3,333,332 in cap room this season. In 2012, Mays signed a three-year deal with the team that included a $500,000 signing bonus. That bonus is counted against the cap in three increments of $166,667 over a three-year period. That means the team now has $833,334 in dead money over the next two seasons, which is a relatively low number, especially considering how much they saved by parting ways with Mays (nearly $6.7 million over the next two seasons). Mays is known as a thumping middle linebacker (just ask Matt Schaub, Ryan Mathews, Tony Moeaki—twice—and Limas Sweed), but he has become a liability in pass coverage and drew criticism for taking poor angles against stretch run plays last season. Mays' poor play, coupled with injuries and a huge salary, led to his release. But he may be brought back to provide depth on both defense and special teams, if he can agree to a more reasonable salary. Known by the media as one of the "good guys," Mays was always accommodating to the press, which has many taking to Twitter to wish him the best. Mays originally entered the NFL as a sixth-round pick by the Philadelphia Eagles in 2006. In 2010, the Broncos traded running back J. J. Arrington to Philly in exchange for Mays. Last season, Mays lost his starting job to veteran Keith Brooking and later ended up on the team's injured reserve list with a left ankle injury in October. With Mays now out of the picture, Nate Irving, Steven Johnson and Stewart Bradley will be competing to win the starting middle linebacker gig this summer. Training camp practices begin on Thursday. 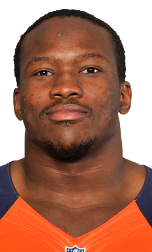 Denver's next order of business will be getting rookie defensive tackle Sylvester Williams locked up. According to a Denver Post report, a four-year deal should be done before the start of camp.